I saw this on tater's blog and made one of myself. 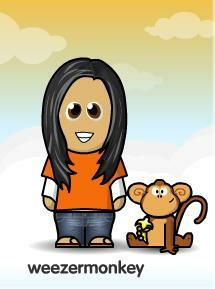 It's WeeMee WeeMo. Hee hee! i found it through my brother, and his looks JUST like him. i canNOT stop laughing at "WeeMe WeeMo." ow. ow! it's just so. damn. funny. ow! She, you, so freakin' adorable!! your headline are sooooo good. ugh. slay me. So cute!!! I have to make on too. Way better than a meez.